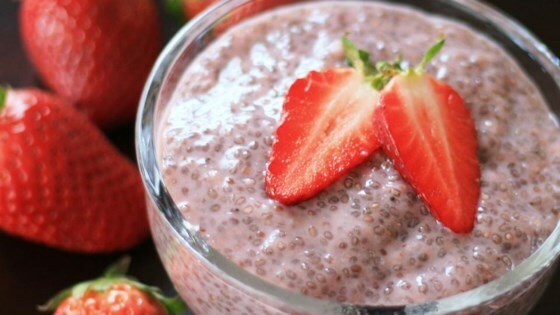 "This is a very quick pudding recipe with chia seeds. No cooking, no fuss, my kind of recipe in the summer. I add strawberry puree, raspberry puree, etc., depending on the availability of fresh fruit." Some might call this dessert, but I call it breakfast with my probiotics and any fruit handy and fresh. Excellent! This is delicious! I even made it completely wrong (Just blended everything) and I ate half of it before I put in in the fridge. Super easy to make. I divided it into 16 small dessert cups, and that way it only amounts to 60cal. per cup! Makes a great snack if you are on a diet. thanks for uploading!